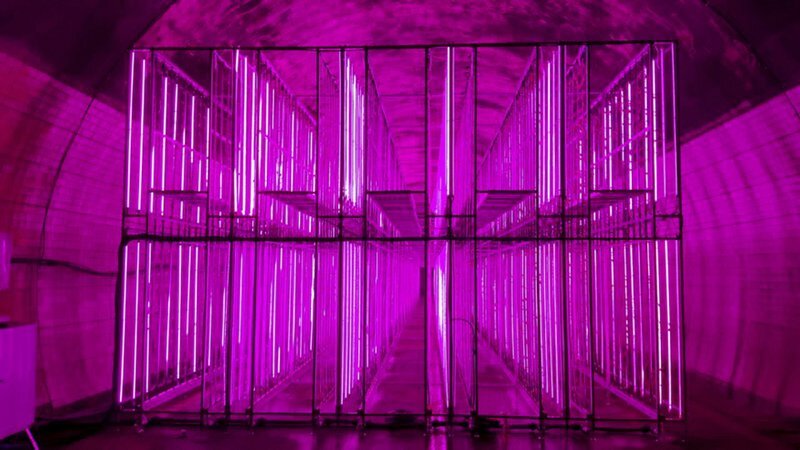 OKCHEON, South Korea — Behind a blue wall that seals a former highway tunnel stretches a massive indoor farm bathed in rose-tinted light. Fruits and vegetables grow hydroponically — with no soil — in vertically stacked layers inside, illuminated by neon-pink LEDs instead of sunlight. 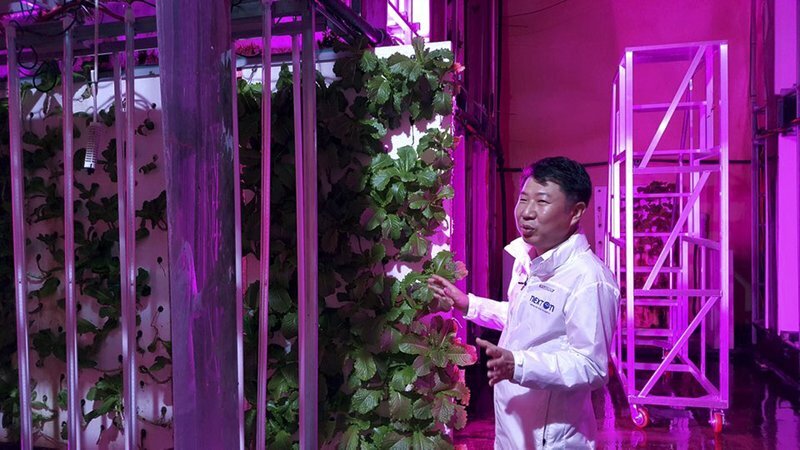 Operators of this high-tech facility in South Korea say it is the world’s first indoor vertical farm built in a tunnel. It’s also the largest such farm in the country and one of the biggest in the world, with a floor area of 2,300 square meters (25,000 square feet), nearly half the size of an American football field. Indoor vertical farming is seen as a potential solution to the havoc wreaked on crops by the extreme weather linked to climate change and to shortages of land and workers in countries with aging populations. Instead of the chirrups of cicadas, Claude Debussy’s “Clair de Lune” resonates in the tunnel in hopes of stimulating the crops’ healthy growth. “We are playing classical music because vegetables also love listening to music like we do,” said Choi Jae Bin, head of NextOn, the company that runs the vertical farm. Sixty types of fruits and vegetables grow in optimized conditions using NextOn’s own growth and harvest systems. Among them, 42 are certified as no-pesticide, no-herbicide and non-GMO products, said Dave Suh, NextOn’s chief technology officer. He said the tunnel provides temperatures of 10 to 22 degrees Celsius (50 to 72 Fahrenheit), enabling the company to optimize growing conditions. High-tech smart farms, used also in places like Dubai and Israel where growing conditions are challenging, can be a key to developing sustainable agriculture, experts said. “Society is aging and urbanization is intensifying as our agricultural workforce is shrinking,” said Son Jung Eek, a professor of plant science at Seoul National University. Smart farming can help address that challenge, he said, as well as make it easier to raise high-value crops that are sensitive to temperature and other conditions. Only slightly more than 16 percent of South Korea’s land was devoted to farming in 2016, according to government statistics. The rural population has fallen by almost half over the past four decades, even as the overall population has grown nearly 40 percent. The Agriculture Ministry announced earlier this year that it will invest in smart farm development nationwide, expanding their total area to 7,000 hectares (17,000 acres) from the current 4,010 hectares (9,900 acres). Turning a profit can be challenging for indoor vertical farms given the high cost of construction and infrastructure. NextOn cut construction costs in half by using the abandoned tunnel and developing its own LED lights and other technologies. The proprietary technologies reduce water and energy use and the need for workers, cutting operation costs, Suh said. Sensors in each vertical layer measure variables such as temperature, humidity, light, carbon dioxide and micro-dust levels to maintain an optimized environment for each crop. The crops will cost less than conventionally grown organic vegetables, Suh said. The farm will begin supplying vegetables to a major food retailer and a leading bakery chain beginning in late August, NextOn said. Next up: more tiers of crops in the remaining two-thirds of the tunnel to grow high-value fruits and medicinal herbs. Suh said the medicinal plant market is currently dominated by a few countries and regions. “Our goal is to achieve disruptive innovation of this market by realizing stable mass production of such premium crops,” he said. Has the media turned on UK’s Prince Harry and wife Meghan?